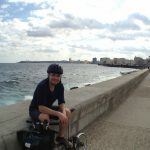 Before Cuba, Pier and I had never biked 100km in one day. The only long-distance cycle traveling we’d ever done was a trip through Italy, biking from Florence to Rome. On that trip the longest ride was 70km and the shortest was 30km because the towns with sights/accommodations were relatively close together. Not so in Cuba. 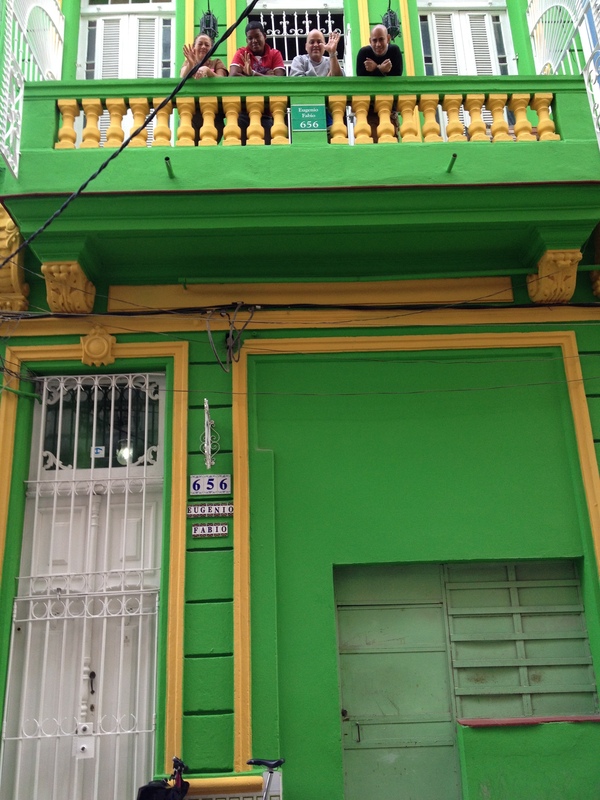 According to my research, there was nowhere to stay until Las Terrazas or Soroa. Las Terrazas was 20 km closer, but the one hotel in the tiny eco-village was expensive, and though there were supposed to be a couple casa particulars in town, we didn’t have contact info for any of them and no idea if they would be available. 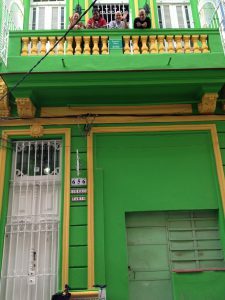 The safer bet was going to Soroa where there was a slightly cheaper hotel and lots of casas. We set out from Havana at 9:15am, our casa owners waving at us, and followed Bicycling Cuba’s “Havana to Las Terrazas and Soroa” route out of the city. According to the book, there were supposed to be bike lanes on Avenue de la Independence, but we didn’t see any, though the cars shared the road with us just fine. In no time, we were out of Havana and on the Autopista! The Autopista (A4) is a six-lane highway coming out of Havana (it quickly reduces to a four-lane). Bicycling Cuba said that the furthest right lane was for bicycles and horses and carts. 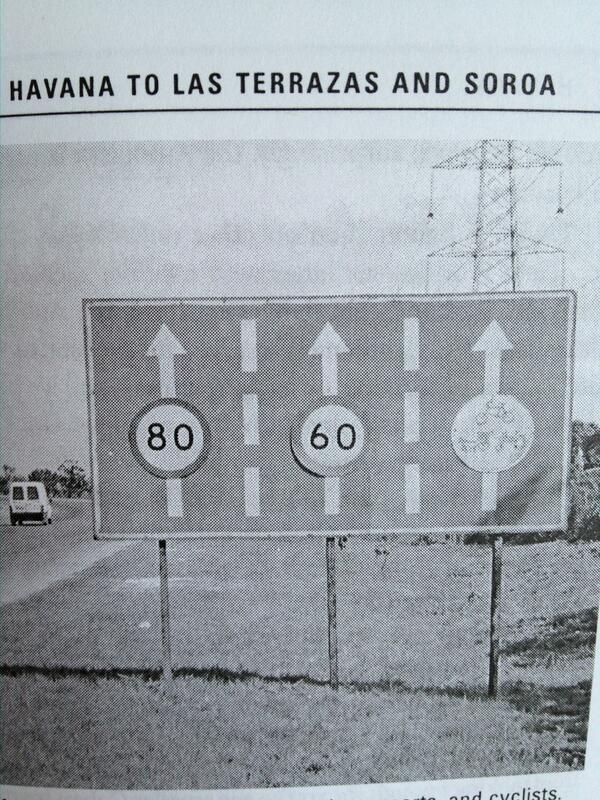 They even had a picture of the sign in the book. But in 2013, we saw no such signs. When cars first honked at us, the Torontonian in me thought they were telling us to get the hell off the road, but they were simply beeping their horns as a polite signal they were passing. And despite it being a large highway, the traffic was light. Sometimes there were no motor vehicles at all! So we took video of us riding all over highway. But, like any multi-lane highway, the Autopista is boring, so at the 25km mark we followed Bicycling Cuba’s suggested route and took the exit to Bauta. As we crossed over the highway, I saw a tiny little sideroad veering into a field. I decided this was a nice, secluded spot for a BATHROOM BREAK. Peeing outside while biking through Cuba is kind of a must. Take note. 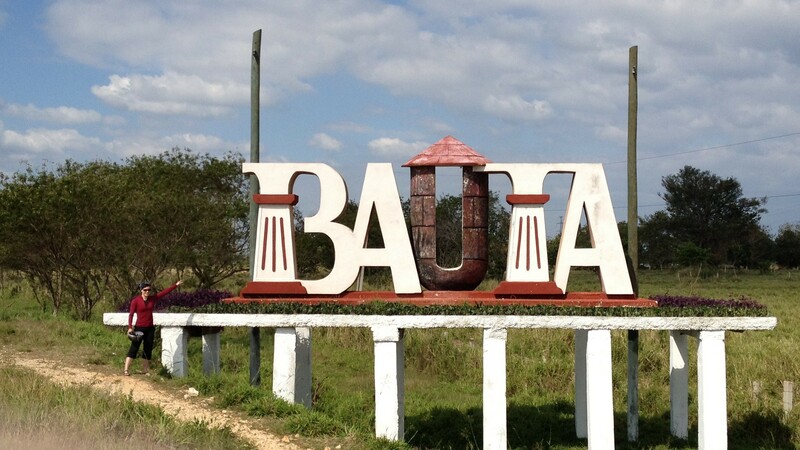 We rode into Bauta, a teeny-tiny town. None of the food stands were open yet, so it’s a good thing we had leftovers from dinner to snack on. We continued on to the Carretera Central (CC), which is a highway in Cuba, but really it’s just a small, two-lane country road. It was nicer cycling – more scenic and even less cars! And just a couple towns along the way. The last (Guanajay) was the largest, and where our guidebook suggested we stop for lunch in the town square. Guanajay must have grown considerably in the last decade. 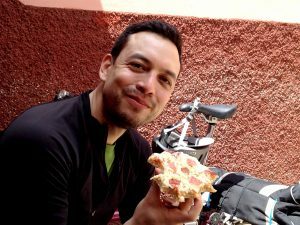 This wasn’t a lazy little square with just an ice cream stand, a peso pizza place and an El Rapido rest stop like Bicycling Cuba described. This square was busy, full of people and stands selling all kinds of stuff. And when we cycled in… everybody turned and stared. That’s the thing about the Bromptons: they look different. And for some reason in Cuba that translated to “they look expensive.” Because every single person we encountered in Cuba wanted to know how much the bikes cost. They’d point to the bikes, then hold up their hand and rub their thumb and first two fingers together, indicating money. Maybe they do that to every tourist who rides though, but it seemed that our strange-looking bikes attracted more attention than average. Unfortunately, the bikes didn’t just attract stares; they attracted hustlers. We did find a peso pizza place, though. 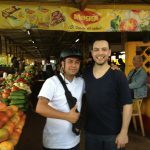 The owners were super nice, and brought us to the back where we could park our bikes for a peso. It was better than being out in the square with everyone staring and rubbing their fingers at us, and the creepy guy trying to get us to give him money for finding us pizza even though we found the place ourselves. In the end, we ate pizza in the back with our Bromptons, then quickly rode out of town. On the road out we saw a lovely peso pizza stand in front of someone’s home. It probably wasn’t there when Bicycling Cuba was written, but that’s where I’d recommend eating in Guanajay. 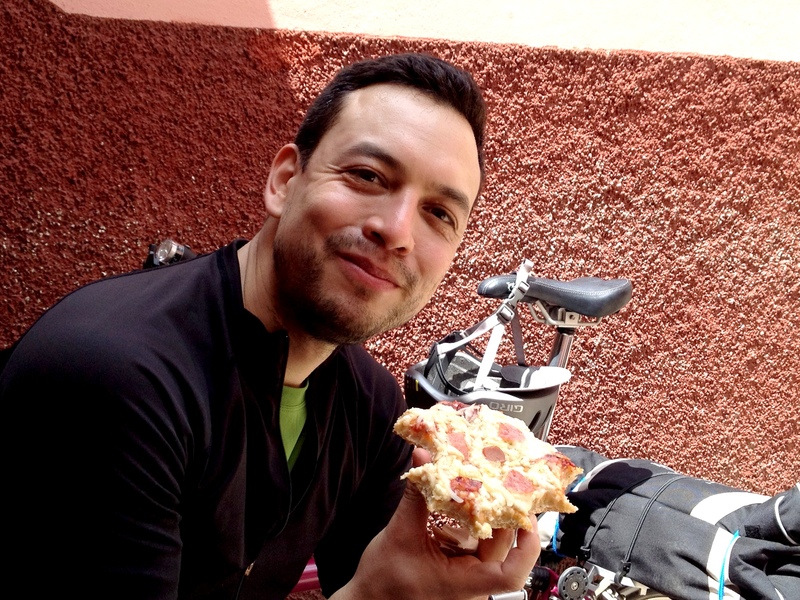 There are a couple peso pizza stands on your way into Guanajay as well. But at least we were fed and ready to ride the rest of our 100km day. 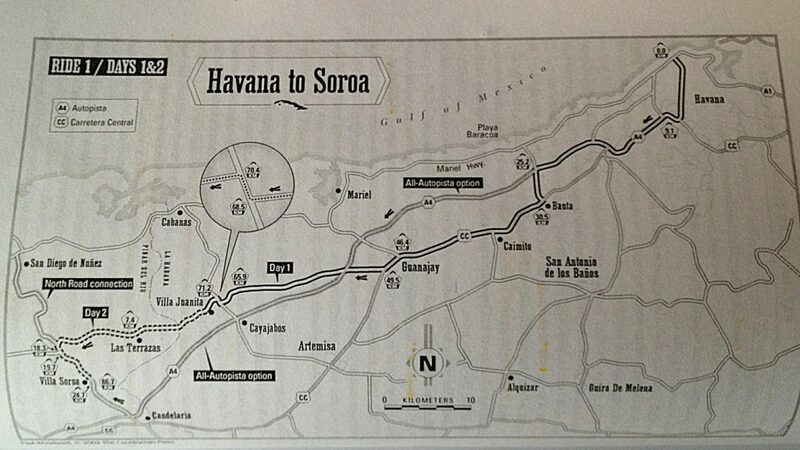 After Guanajay, we got back on the Autopista and hightailed it to Soroa. We took a break at the exit to Las Terrazas because it had this nice little shelter built, probably for people waiting for rides. We used it to get out of the sun and have a drink. The next exit was Soroa, though there was no sign. As usual, Pier approached one of the hitchhikers at the intersection, pointed to Soroa on our map, then to the exit, and got a nod and a thumbs-up. 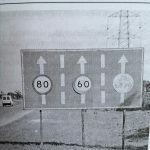 It was the right road! Up until this point, our ride had been pretty easy and flat. But Soroa is on the mountain, so our last 15km of the day was a grueling uphill. I now understand why people who live in mountainous regions would opt for a geared-down Brompton. Ours are geared up to go faster, and our lowest gear wasn’t low enough for this steep incline. But no matter because in our lowest gear we moved at 7km/hr, and our walking pace up the mountain was 4.5km/hr. If we’d had lower gears, we wouldn’t be going any faster than walking pace, so what’d be the point? Finally, we arrived in Soroa! Unlike in Guanabo, we had much better luck riding into town and finding a place for the night. We went to the hotel where the security guard told us there were no rooms available. This may or may not have been true, but no matter because we wanted a casa anyway. He pointed to the boy beside him and said he would lead us to a nice casa particular. The boy spoke no English, but he got us there, and it was indeed a very nice casa particular. In fact, despite the roosters, Casa Dona Dunia was our favourite casa in Cuba! 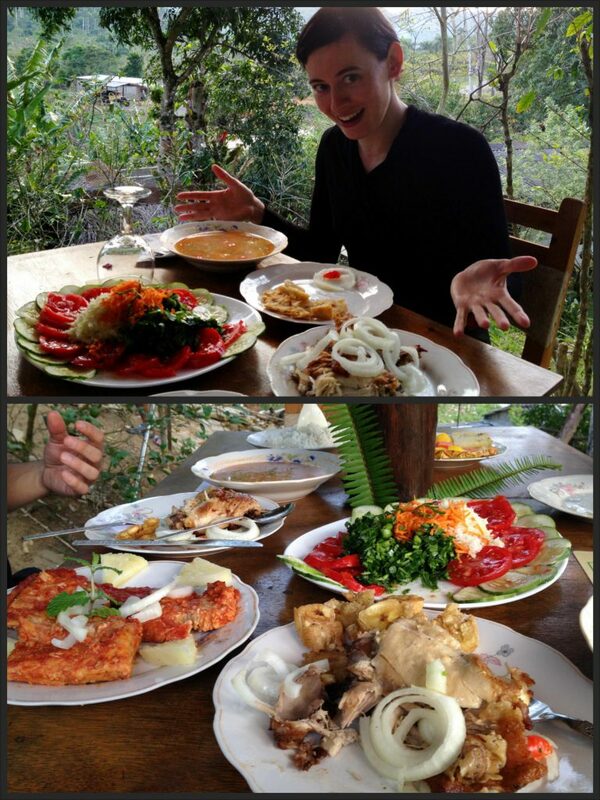 Especially awesome were the delicious meals Dunia served. After riding 100km on nothing but peso pizza, roadside bananas and leftover shrimp, a gigantic four-course dinner was exactly what we needed! We ate every last morsel. All in all, 100km in one day was no problem on our Bromptons. 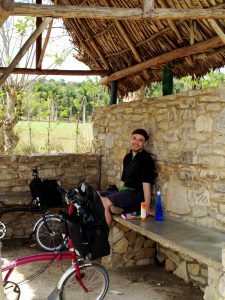 Next post, strategies for not starving while biking through the remote Cuban countryside.